We’re at that time of the year again where we wrap up 2016 and look forward to 2017, which means it’s time to think of your New Year’s resolutions. Have you developed your list? 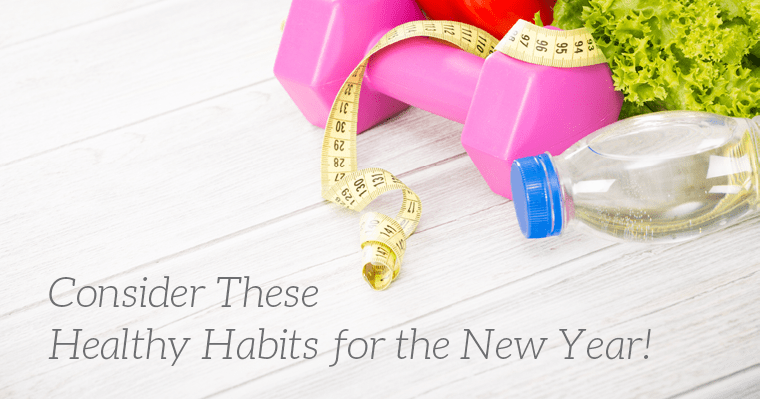 Everyone at our dental office wants you to live a healthy life, so we’ve gathered our top five healthy habits for the New Year – feel free to add them to your list! Exercising is a common New Year’s resolution and for good reason! Exercising has short and long term benefits. It improves your mood, reduces stress, and feels worthwhile! It prevents health problems, including obesity, heart disease, diabetes, and much more. To make exercising a habit, it’s important to stick with a routine for three weeks. Your workouts should include cardio and lifting weights. These types of workouts are excellent to develop muscle and lose fat. No matter what your goals are, exercising is something you should include in your weekly routine. You’ll feel so much better about yourself! Tip: Mix it up! Don’t limit yourself to just the gym! You can take a 20-minute brisk walk around your neighborhood or go on YouTube and follow top trainers to participate in their workout videos. This will spice up your workouts and prevent you from plateauing. Eat good fats (Omega-3s, etc.). Eat a healthy breakfast with lots of protein. Are you a coffee drinker? Instead of sugar and milk, try coconut oil. To get more details on what foods to avoid, check out this ARTICLE. Sleep is the time for your body and brain to rest and reset. Getting about 7-8 hours of sleep per night is important. If you’re not getting enough sleep, it will lead to health problems down the road, such as obesity, heart attacks, stroke, hypertension, and much more! Additionally, it slows down your daily performance. To be consistent with your sleep, develop a sleep ritual before turning in for the night. Read a book or listen to music right before going to bed. Keeping the same routine every night before bed can help promote a better night’s sleep. From laptops to smartphones to tablets, life is consumed by technology. It’s hard to get away from it. While we understand society can’t get away from technology 100%, we do recommend try to dedicate about an hour of your day free from technology (before you go to bed!). If you obsess over technology before you go to bed, studies have shown your quality of sleep will decline. In the long run, it could decline your quality of life. Learn to unplug, and you’ll see a huge difference with your health. Being dental experts, we must talk about taking care of your oral health. Not only is it important to visit the dentist every six months for a check-up, it’s equally as important to practice your at-home care consistently (brushing and flossing!). Excellent dental care keeps your teeth AND your overall health in tip top shape. That’s right. Your oral health directly affects your overall health. Studies have shown dental diseases (such as gum disease) can increase your chances of serious ailments, such as heart disease, diabetes, and much more. So, before you skip flossing or brushing, think of your body’s health. Give your dental team a call to schedule your next dental checkup – your body will thank you. Let us know what your New Year’s resolutions are for 2017. Share your comments below!